The Knickerbockers have a habit of giving big men a lot of money to try and clog up the paint. 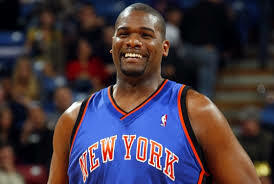 In 2005, they signed Jerome James to one of the worst deals in New York Knicks history to clog the paint. The Knicks problem is that they don’t realize how great the draft is. They are so obsessed with winning now because that is what the New York market expects. The Knicks will throw money and throw away the future to help win now. They were very lucky with drafting Porzingis last year, but sadly they don’t have a draft pick this year.. AGAIN. Knicks fans should pray that Jakob Poeltl, who was drafted with the Bargnani first round pick sent to the Raptors, doesn’t turn out to be a star. The Knicks have decided that the best way to currently get better is to sign players. They realized that they don’t have any young pieces and the only way to get good players is through trades a-la Derrick rose or give once-good players way to much money like Joakim Noah. NBA players like the spotlight and there is no place bigger for the spotlight then in NY. The Knicks have had a lot of bad years and it doesn’t seem like it is getting better anytime soon. But luckily, Phil Jackson is working his magic and doing what he can to make the Knicks an elite team. It is all a process and it wasn’t easy with Isiah Thomas screwing up the team. But with smart management and patience, the Knicks will be elite once again.